A good quality paint sprayer makes painting the inside or outside of the house much faster and easier. The three top rated paint sprayers featured here are frequently purchased by customers due to the fact that they perform well, they are reasonably priced and they are by reputable companies. With all of the choices on the market for paint sprayers, we’re going to make your choice easier by highlighting the top rated paint sprayers available. We’ll reveal the features and benefits of the top three that make them customer favorites. This information will help you decide if any one of these three will meet your paint sprayer needs. Painting with a paint brush can be exhausting and time consuming and it also tends to leave brush stroke marks. The same can be true with roller painting. A paint sprayer may seem difficult to use, but once you get the hang of it, you will love the speed in which you can paint an entire room compared to the time it takes to use the traditional brush or roller methods. The Wagner Paint Sprayer has put together several design elements and factors such as variable air pressure, a two-stage turbine and a metal spray gun which makes painting walls and surfaces much easier and faster regardless of whether you’re painting with latex paints or thinner materials including lacquers and stains. There are three different spray patterns that provide the painter with plenty of versatility. If you need to reach higher places, just use the convenient 20 foot flex air hose. It features a Lock-n-Go front end that allows for fast changes. 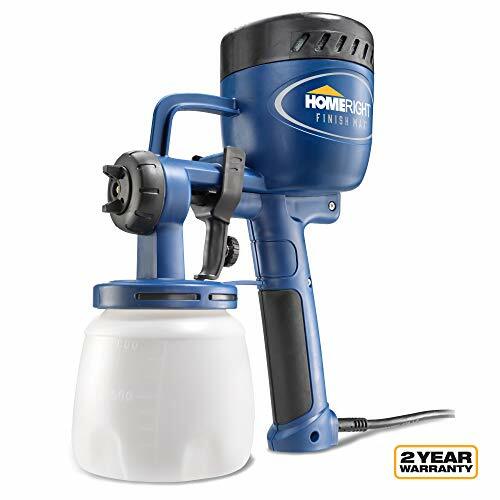 This paint sprayer includes two air filters that will protect your finish from dust and has two size cups: a 1-quart, viscosity cup that is contractor grade and another that is 1 1/2 quart plastic cup. The variable air pressure this paint sprayer provides prevents over spraying with thinner materials. Since it can spray a variety of paints including primers, lacquers and stains, it can be used for a multitude of painting projects including priming and painting door trim, cabinets, decks, staining furniture, woodworking projects and much more. You will be able to switch from spraying large surfaces like walls to doing more refined work like painting trim or windows. The Wagner Paint Sprayer is very lightweight and easy to handle. You can have it set up and ready to go within minutes. The included viscosity cup lets users measure the density of the materials that they will be using. Then the paint sprayer can be adjusted accordingly. All you have to do to change the spray pattern is to turn the ears on the cap of the spray nozzle. You can choose from round, horizontal or vertical spray patterns. The advanced features of the Graco paint sprayer may have you thinking it’s complicated but the opposite is true. The Graco TrueCoat paint sprayer has the ability to spray in all directions including upside down thanks to the disposable FlexLiner paint bag system. This is one of the easiest paint sprayers on the market to use; simply fill the bag, squeeze and start painting. When the job is done or if you need to change colors, just throw the FlexLiner bag away, put in another and repeat the process. You can use the Graco Paint Sprayer with all kinds of paints and stains. All you need to do is squeeze the bag and you’re ready to paint. You will find that you get your painting done whether indoors or out much faster and without the previous hassle that some paint sprayers can cause. The durable, high-pressure piston pump will work with all paints and stains and you won’t have to thin the paint first like you do with other models. Thanks to the VacuValve technology, a vacuum is created that allows the painter to spray in any direction without losing prime. This paint sprayer is designed to work in all areas for all types of projects. 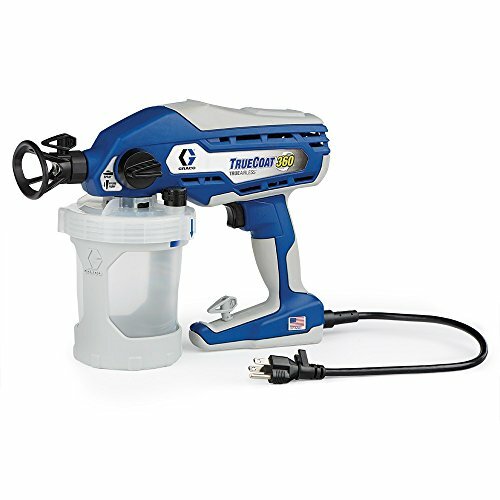 You won’t ever want to go back to another paint sprayer once you’ve tried the Graco TrueCoat 360. You’ll be working like the pros with the HomeRight C800766 Finish Max Fine Finish Sprayer. By using a high volume of air at a low pressure, users will be able to get a very even finish on the paint project surface with no brush marks. There are three precision spray settings available. The other benefit of this low pressure usage us that less overspray occurs which means less prep time and cleanup. The three spray settings are horizontal, vertical and circular and they can be set anywhere from 1” to 6” wide. The tighter spray pattern is great for finishing contoured surfaces such as shutters, trim, furniture, lattice work and desk spindles. The fact that you can set the sprayer to such precise settings means that you will achieve a high quality finish on your projects that will rival a professionally done paint job. You do not need any air compressors, pumps or hoses with the HomeRight Max Fine Finish Sprayer. The nozzle is made of brass for longevity and strength. The ergonomic design and light weight make it easy to use, even for long periods of time. The 27 ounce container can be used to apply finishes such as sealers, enamels, primers, stains, varnishes and polyurethane. There are many accessories including a viscosity cup that allows you to dilute the materials if desired and an air blowing nozzle for cleaning computer keyboards and other small, tight spaces. Paint Sprayers come in all sizes and varieties. They are useful for enabling painters to finish all kinds of painting jobs quickly and efficiently without brush strokes or aching shoulder and arm muscles. These top rated paint sprayers that we have reviewed here are customer favorites for many reasons including ease of use, performance and affordability. They work well with many kinds of materials such as metal, masonry, brick, wood, sheetrock and more. If you do not have a lot of experience working with paint sprayers and don’t know a lot about them, choosing one that will work for your projects can be daunting. This buyer’s guide has been written to provide you with the information you need to be able to sort through the available choices and decide on the right paint sprayer for the jobs you have in mind. Using paintbrushes and rollers to paint can be a very time consuming process. A Paint sprayer will drastically cut down on the length of time it takes to get your painting projects done. A paint sprayer can be used for large surface painting jobs like the exterior of a home and it can be used for smaller, more precise jobs like shutters, furniture and more. One of the reasons that paint sprayers are so popular is because of the uniform finish it provides on whatever you are spraying. There are a few questions you can ask yourself before you choose a paint sprayer. The answers to these questions will help steer you towards the right paint sprayer for all your painting needs. What type of projects will you be doing with your sprayer? – The types of jobs that you want to do with your sprayer can determine the kind of sprayer that you get. If all you will be doing is painting home exteriors or interior walls, you will not necessarily have to worry about precision as much as you would if you were painting furniture. What materials will you use your sprayer on? – Most sprayers have the capability to paint a variety of materials such as wood, plastic, metal, sheetrock, and many others. How large are the areas you will be painting? – As we mentioned above, if you are going to be painting large surface areas, precision is not really that important. It is best to look for a paint sprayer that can be versatile and handle both large surface painting and more precise painting. How thick is the paint or stain or primer that you are using? – Many paint sprayers have the ability to handle all different kinds of paint, stains, lacquers and more. Male sure that the one you are looking at has this versatile capability. How often will you be using your paint sprayer? – If you won’t be using your paint sprayer very often it is not as important to get a high end model. However, if you will be using it on a regular basis such as in a painting business or if you paint furniture that you build regularly, you will want to get a higher end model to accommodate and handle the workload you will put on it. When Should You Use a Paint Sprayer? If you are not familiar with paint sprayers you may not be sure what jobs and projects are appropriate for paint sprayers and which ones would need to be done using brushes and/or rollers. We have provided some instances where paint sprayers are commonly used and produce very nice results as well as situations where they are better not used. Covering large spaces such as interior walls or exterior parts of a home. Painting furniture due to the fact that the fine spray of paint easily gets into the hard to reach spots that brushes and rollers can’t get into. Small paint jobs can be difficult if you don’t have a proper paint area for your project. You are low on paint. Paint sprayers use more paint that brushes or rollers, so if you are worried about running out, it is better to use a roller or brush. Using a paint sprayer involves taping and covering things that you don’t want covered in a fine mist of paint. The rewards when using a paint sprayer are worth it, even though there is set up work associated with it. Clean up is a little more detailed and time consuming than it is with brushes and rollers. 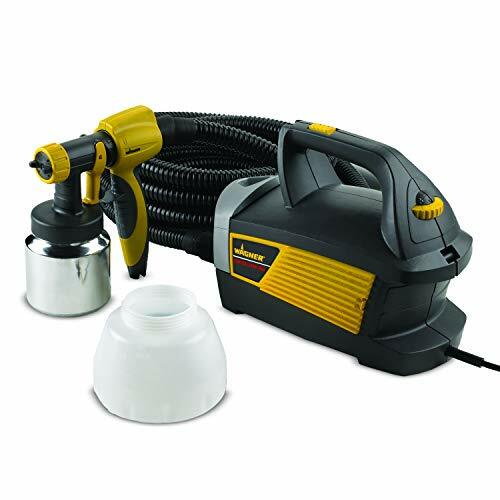 Conventional Pain Sprayers – This type of paint sprayer uses an air compressor and creates thin finishes of paint on the surface of the item being painted. In most models the air compressor is built into the paint sprayer so it is not a separate piece. You can also get a paint sprayer that uses an external air compressor. Some people find the conventional paint sprayers difficult to use. Since on most models have adjustable settings for fan spray, paint flow and air flow there can be a steep learning curve which many people simply don’t want to bother with. One of the drawbacks to conventional paint sprayers is that they can be very wasteful when it comes to paint. On average only about 30% of the paint actually makes it to the object your painting. High Volume/Low Pressure Sprayers – This type of paint sprayer was created due to the flaws in the conventional paint sprayer. The top rated paint sprayers we reviewed here are all high volume/low pressure sprayers. By designing a sprayer that combined a higher volume of air with a low pressure users will now have an 80% transfer rate of paint compared to the 30% that the conventional sprayer provides. Because this type of paint sprayer is known for its precision, it is the perfect choice for projects that need a lot of detail and precise painting. Airless Sprayers – If you are not concerned about overspray, an airless sprayer may be a good choice. These types of paint sprayers use electric motors, gas motors or hydraulic motors to power the sprayer. The power of an airless sprayer is unsurpassed. They produce a thick, even coating which means that less coats of paint will be required than normal. These types of sprayers are also good for penetrating hard to reach cracks and uneven surfaces. Spray fan and paint flow on airless sprayers are not adjustable so figure on purchasing extra tips that will expand or change the fan and paint flow that the sprayer puts out. There are several different features that a paint sprayer may offer. These will vary from model to model. You should have an idea of the features you desire your paint sprayer to have before you purchase so you get the model that has the capabilities you want. Adjustable Paint Sprayers – With adjustable paint sprayers the paints and primers can be applied at various thicknesses, in different kinds of spray patterns and also at different speeds. This makes the paint sprayer fully customizable to the project you are working on. Faster Cleanup – Cleaning a paint sprayer is probably one of the least liked things about them because they can be much more time consuming to clean than regular brushes and rollers. Some models will attach to a garden hose which makes clean up faster and others, like the HomeBright Sprayer, use a bag system that is very easy to clean. Easily Moved Around – The more portable the paint sprayer is, the easier time you will have using it for a multitude of projects. Some models have backpack carrying mechanisms and others use wheels. Personal preference plays some part in which is better. Power source choices – Paint sprayers are typically powered by electricity, gas or a battery in the case of cordless sprayers. There are several accessories that you can purchase that will go with your paint sprayer and make it even more efficient. These accessories can also help extend the life of the paint sprayer. Extension Rods – If you need to paint areas that are not easily accessible, an extension rod is a handy thing to have on hand. It’s a great way to paint decks and ceilings without hurting your back at all. Paint Sprayer Filters – Using filters with your paint sprayer removes debris from the paint, giving it a smooth finish and preventing clogs from occurring. Protective Gear – The right safety or protective gear is important when operating a paint sprayer. Protective clothing, goggles and an appropriately graded respirator are sufficient. Spray Tips – Tips can be purchased that will provide spray patterns that are different than what the paint sprayer normally has. They can also be good for handling thinner consistency paints or thicker as well. Tips can be used for both indoor and outdoor projects. If you are looking for a way to dramatically increase your painting speed, a paint sprayer is a terrific investment for you to make. With so many different types of paint sprayers on the market today, you will need the information you have learned from this guide to narrow down these choices and see which types match the projects you have the best. By arming you with the tools to understand the specifics of a paint sprayer, we are enabling you to have the knowledge and confidence to choose the right one and not worry that it will not be able to handle your projects. Some people think that paint sprayers are really difficult to learn how to use properly. The older models were a little more complicated to learn, but new technology has made the paint sprayer much less difficult. Check out the top rated paint sprayers reviewed here and see which one meets your needs and project list.